Leave ordinary sound to ordinary people. Upgrade your listening experience with PowerJax. This sound will rock you to the core. Molten bass pours into your ears; beats pump their way into your veins. Fired, toughened, armoured, plated – however hard you wear them, they won’t wear out. With inline stainless steel remote and mic for total volume and playback control. Made in metal. Meant for music. Must be worn to be believed. This sound will rock you to the core. Sublime bass pours into your ears; beats pump their way into your veins. Pure. Unadulterated. Undistorted. You’ll hear more. You’ll feel more. Nothing will ever sound the same again. Large 13.5mm dynamic driver delivers high performance acoustics. Dual metal voice coil enriches the sound: copper delivers thumping bass, aluminium gives you clarity, all via the finely tuned sound port. And the oversized (5mm) sound tunnel injects the music straight to the sweet spot. Reinforced plug + inline remote. Stop your music and conversations from disappearing into thin air. Soft silicone eartips seal out more ambient noise than conventional ones. Fed up of dirty looks? Keep your music in your ears and the world out with 2-Way Noise Isolation. Dual injected silicone eartips for better fit and function. 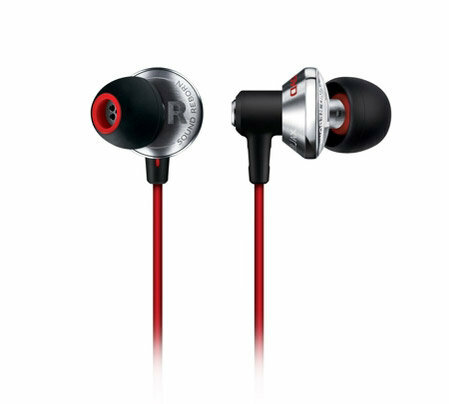 The firmer red silicone ensures the eartips have a good grip on the earphones so you’ll never lose them. The softer black silicone moulds to the shape of your ear canal for a tighter seal, keeping noise out and music in. Keep your device in your pockets and your hands out of them. The inline stainless steel remote and mic deliver total volume and playback control, plus smooth switch from chat to tunes. Click your way around your music, plus answer and end calls with the sleek yet tough stainless steel remote. Adjust volume with the + and - buttons. Control music and video playback with the centre button: 1-click play/pause, 2-click skip to next, 3-click go to previous. Maximum comfort with minimalist looks. You get a snug, velvety, custom fit thanks to the compact size of the earphones and the smooth, pliable silicone eartips that mould to the shape of your ear canal. Try them on and you may never take them off. Every pair comes with SoftSeal eartips in three sizes – S, M, L. Try them all to make sure you find your perfect fit. Getting it right increases comfort, keeps noise out and music in, and delivers superior sound quality with improved bass. Stainless steel housing- a bigger sound carved out of metal. A bigger sound carved out of metal. Tough thin walls create more space. More acoustic volume. More air movement. More like a gig inside your head. And no amount of plastic could ever sound – or look – this good. We apply 1300°C heat to injection-moulded steel for 10 hours so thinner walls can be carved out, resulting in an enlarged acoustic chamber. The increased driver movement delivers more power for crystal clear, pitch perfect, pure, glorious sound. Steel, titanium, gold, Kevlar®. We forge the future with durable materials fused with pioneering techniques. Hardwearing and precision- crafted, our earphones will stand the test of time – just like your favourite tracks. Premier grade materials for unstoppable performance. 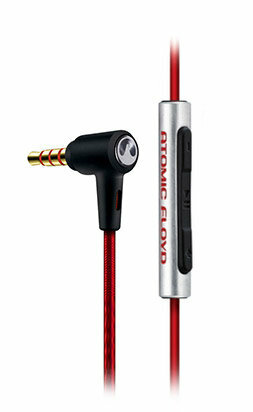 Anti tangle, high performance Kevlar® audio cord + noise eliminating, low friction TPU earphone cables. Right angled, rugged, resilient plug with gold plated, noiseless connector. Made in metal - Built to last. 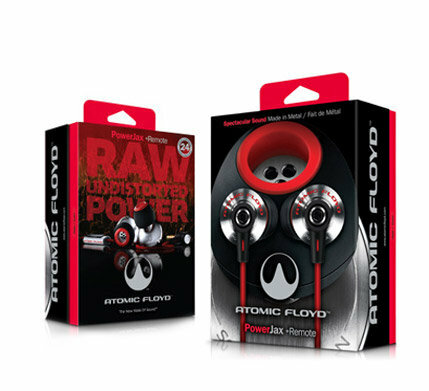 These Atomic Floyd PowerJax+ earphones are Precision-crafted in durable metal, PowerJax +Remote in-ear headphones deliver pure sound and fit so snugly you won’t even know you’re wearing them. Built for life, these made-for-iPhone headphones block out ambient noise while the mic and remote lets you answer calls and change tracks without having to take your device out of your pocket.Two-way noise-isolating design, Silicone eartips mould to your ear canal, Crafted in metal for powerful sound, In-line mic and remote to take calls with your iPhone, Eartips come in 3 sizes, all in the box.